I managed to get my hands on a couple of bulbs of fat, golden, oak-smoked garlic this weekend. (Cambridgeshire readers should head straight over to the River Farm Smokery in Bottisham for more smoked goodies.) It’s beautifully pungent stuff; years ago, I bought a plait of smoked garlic for my parents, who ended up having to keep it in the garage to prevent the whole house from taking on a smoky, garlicky taint. If you’ve not tried smoked garlic before, it’s pretty easy to imagine, but the reality is always a little startling. This is a fiercely flavoursome product. You can make a little go a long way, but I really like to use whole cloves of it in casseroles or around roast dishes. 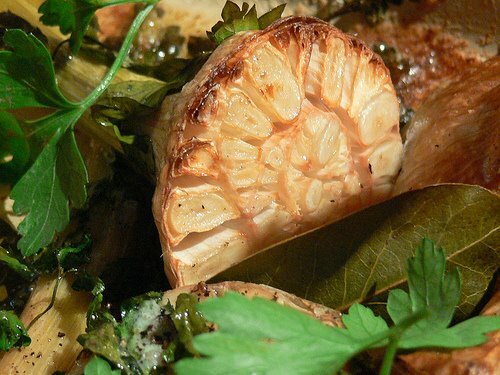 Much of this bulb found itself being used in a roast lamb dish with beans – just follow this recipe and add about eight whole cloves of smoked garlic in place of the chopped fresh stuff – you’ll need a couple of extra cloves to stuff into the skin of the lamb as well. When garlic is smoked, its cloves soften a little and turn a lovely buttery yellow. 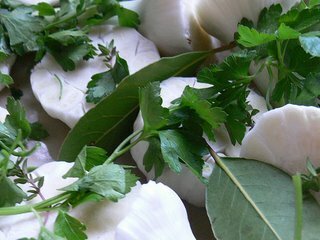 The smoking process forces some of the natural sugars in the garlic cloves to bead on the surface of the clove, under the papery skin, becoming sticky, tacky and sweet. You can use these cloves wherever you’d use raw garlic; the whole bulb is also exceptionally good roasted. Try making roast garlic and fresh tomato pasta with a smoked bulb for great depth of flavour. I really like the roast cloves popped out of their skins and spread on a good crusty bread, sprinkled with a little salt. The squashed, roast cloves are also fantastic stirred into mashed potatoes. Smoked garlic and honey are two flavours which, for me, seem to have been invented for each other. I kept five cloves of the garlic back to make a jar of smoked garlic honey baste. To make your own, you’ll need a jar of honey (mine is some of our local wildflower honey – anything with a delicate, flowery flavour will do, though; try clover, orange blossom or lime blossom honey) and five unblemished cloves of smoked garlic. Empty the jar of honey into a saucepan and warm it with a jam thermometer in the pan until it reaches 100° C. Put the whole garlic cloves at the bottom of a sterilised jar and pour the hot honey over them, then cover and refrigerate. The garlic will start to give its smoky fragrance up to the honey almost immediately, and the honey will have a noticeable flavour after a day or so, but for best results the jar should be left for around a month before using. Brush the infused honey over meats before roasting or grilling, use as a surprisingly delicious dressing for baked apples, or spread on some toast and nibble with a glass of whisky for a midnight snack. This Chinese appetiser is one of my favourites, and it’s surprisingly easy to make at home. 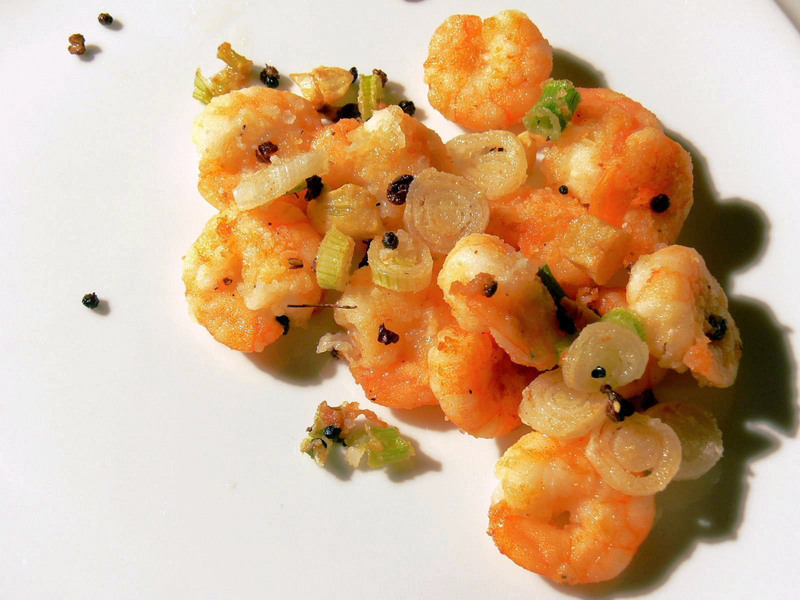 Szechuan peppercorns are toasted in a dry pan until they release their amazing fragrance, then combined with flours and some other seasonings to make a feathery crisp and light coating for the prawns. Garlic and aromatic spring onions (scallions for American readers) are dusted in the flour coating and fried, making a crisp and delicious garnish for the prawns. …in Great Britain the term “shrimp” is the more general of the two, and is the only term used for Crangonidae and most smaller species. “Prawn” is the more special of the two names, being used solely for Palaemondiae and larger forms, never for the very small ones. In North America the name “prawn” is practically obsolete and is almost entirely replaced by the word “shrimp” (used for even the largest species, which may be called “jumbo shrimp”). If the word “prawn” is used at all in America it is attached to small species. Begin by toasting the Szechuan peppercorns over a medium flame in a dry frying pan until they start to release their fragrance (about 4 minutes). Combine the toasted whole peppercorns in a large bowl with the black pepper, rice flour, cornflour and salt. This sounds like a great deal of salt, but this dish requires a lot, and you may actually find that you want to sprinkle a little more over at the end, so be generous. Chop the garlic very roughly, and slice the spring onions into little discs. De-vein (actually de-intestine) the prawns if you want – if I am confident with the source of my shellfish, I don’t usually bother. Dredge them in the seasoned flour. Heat up a 2cm depth of oil in a thick-bottomed pan, and fry the prawns in small batches when the heat is searingly hot, turning until the coating is golden and crisp. Transfer to a kitchen paper-covered plate in a warm oven to drain and keep warm as the other prawns are cooking. When all the prawns are ready, dredge the garlic and spring onions in the seasoned flour, using a slotted spoon to remove them from the flour bowl. Saute them in the oil you cooked the prawns in until their coating is also turning golden. Remove from the oil with the rinsed and dried slotted spoon and place on kitchen paper to remove any excess oil. Arrange the prawns on plates, sprinkle over the onion and garlic mixture, and serve immediately.